Model Zero is Soundcore’s first premium wireless speaker. It uses ‘Transducers Designed by SCANSPEAK’—the first time they’ve ever been used in a wireless speaker—and it’s also Hi-Res Audio Certified. This certification is only awarded to speakers capable of playing the highest-fidelity, better-than-CD-quality sound. In addition to the exceptional audio quality, you also get 10 hours of continuous playtime and IPX5 water-resistance to allow you to take your music outdoors. To be in with a chance of testing Model Zero for yourself, share this event on your social media and leave your review plan and a screenshot of the shared page in the comments below. We’ll choose 3 users who create the best test plans to win a FREE Model Zero speaker. We want to see your creativity shine in your review, so use your imagination to make your plan stand out from the crowd! If you’ve made high-quality reviews in the past, or you’re an influencer, don’t hesitate to let us know so we can take your experience into account. Additionally, we’re sharing a Community Exclusive discount for Model Zero. * US residents can use code: SDCMODEL to get 15% off. * Residents of the UK, Germany, France, and Italy can use code: SCMODEL1 to get 25% off. Codes are valid from December 4th to 16th, but there are only 10 codes per country so it’s first come, first served. 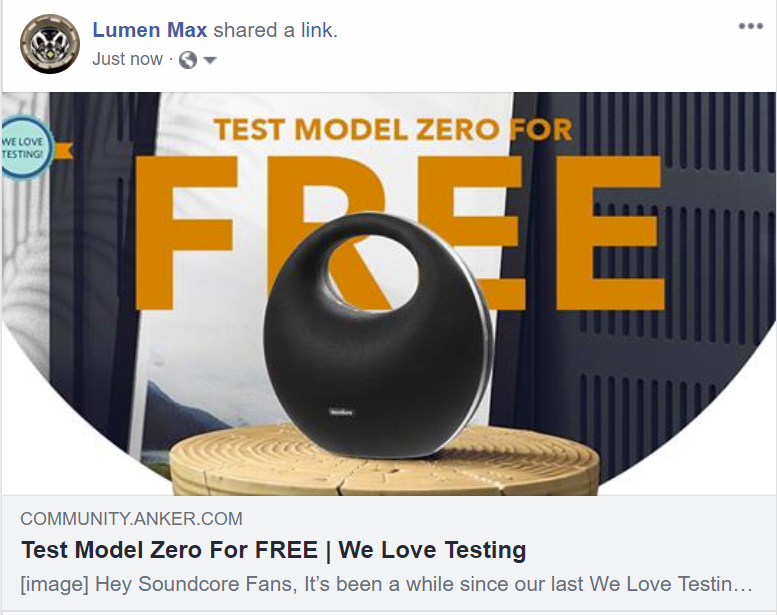 Share this event on your Facebook or Twitter and leave your test plan for Soundcore Model Zero in the comments below with a screenshot of the shared event on your social media. This event runs from December 4th to December 12th, 2018. The testers will be announced on the community on December 14th, 2018. Only open to residents of the US, UK, Germany, France, and Italy. 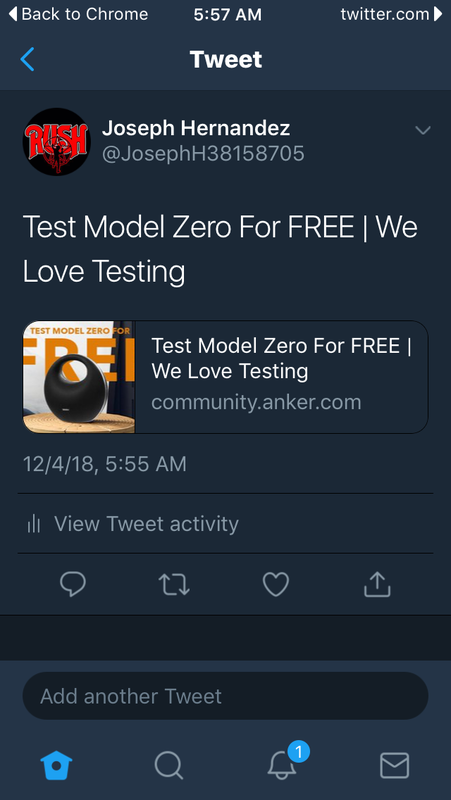 Thank you for taking part in the Model Zero We Love Testing event. I’m thrilled to announce the three lucky winners below get the chances of hands-on testing on this premium speaker. All the winners will receive a confirmation email within two weeks. After you receive your Model Zero, please post a link to your review under this thread within two weeks. Hope there will be winners from the community. I would like to talk about the experiences regarding that great speaker and see another review! This testing event is hosted by the community, so the testers will be chosen from the community. So there is hope to find another owner of that great speaker, to talk and discuss with. My love to it increases day by day! wow!! great giveaways! I love it! I won't be entering. I got my wonderful infini (which is fantastic). Some decent leads and a decent powerbank is on my wishlist. Nice, I'm looking forward to the reviews! I try always to post my reviews at AMAZON. as they reviewed "not purchased" articles. As I wrote a review at AMAZON and here for that great speaker I will of course NOT take part. Good luck for all others! Wow busy month over there at Anker. I really hope to be chosen as a tester🤞 🤞 been waiting for the zero to come out for some time. This is one that I'll leave to those of you who do more in-depth, thorough reviews. I have yet to dip my toes in to the "reviewing on youtube" waters. Looking forward to seeing what you all have to say about the Model Zero. Overall, Project Zero is about giving the would-be consumer a glimpse at owning one of these stunning hardware devices and allow them to feel fancy, rich and of 1%’ers ilk without actually purchasing. I will film my goals below, post onto Youtube (Hope that I can be like that crazy rich kid who reviews toys), share the video on Twitter, Anker Community, Reddit Community and blast the music so loud my neighbors want to come over and party. 1. Provide a video of the unboxing and setup of the product. 2. Screenshots and instructions to download the Soundcore App. 4. I will start with some smooth jazz or classical orchestra to hear different instruments without too much background noise. 6. Furthermore, I will test it to the limits with Dubstep and EDM. all while fighting with my wife who will also have control using the Dual Bluetooth technology. Hope this fight won’t last too long! 8. Exhausted after all of these tasks, I will jump in the shower with it and sing Miley Cyrus to you all to test out the IPX-5 Ratings! 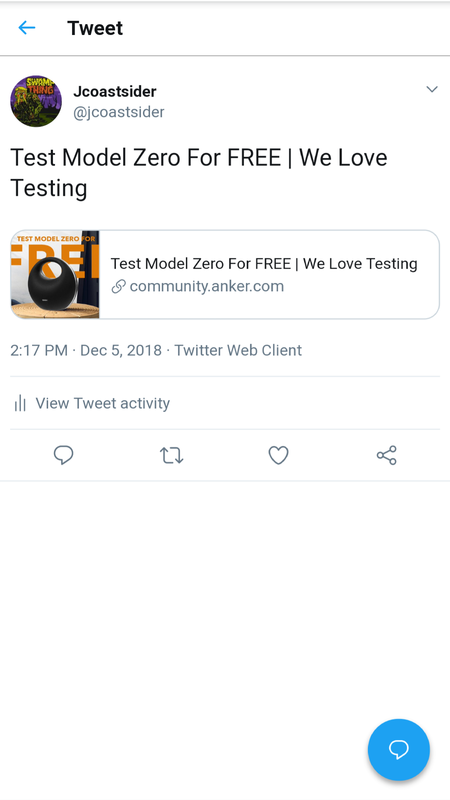 I have been keeping up with the Model Zero for some time now and am glad to see a testing event for the community. My testing plan would be a little unconventional, but thorough. Here is where it gets fun for me. My work has a happy hour in our office every 2 weeks. Beer, food, and just hanging out decompressing at work. We normally have it in one of our game/break rooms, which has a decent sized conference area that is being worked on. I want to set up the Zero in the room hooked to a laptop with various music genres and songs and have people swing over to test it. Let them make their own choice on volume and the song ( as no one is on this side currently) so I can get feedback from them on their thoughts to it. It allows me to give an unbiased review of the Zero by taking my own preferences for music out of the equation and giving me a diverse test group. We come from all different backgrounds with different tastes, so what better way for me to really put it to the test. As always, I want to give a thank you to @AnkerOfficial for this event. This is still one of my favorite communities to be a part of. Test distortions by listening to vocals on high volume. Connect it to TV via AUX connections and watch movies. Compare it to the Harmon Studio 5. Test Bluetooth connection, including range.